Daffodil Day is August 27th, it is the cancer societies major fundraiser for the year. 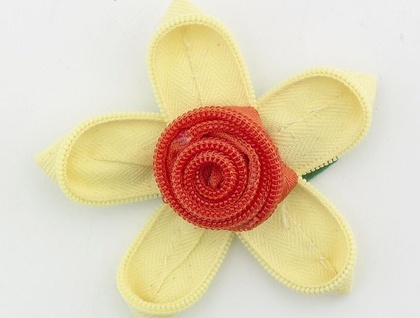 Since helping people with cancer is a cause that is close to my heart, I've decided to sell off a few limited edition vintage zippitydoodah Daffodils to help out the cancer society. So when you buy one I'm going to send you a lovely sunny daffodil zippitydoodah to wear and I'm going to put your money in the Cancer Societies collector bucket on Friday 27th. Zippitydoodahs are quirky brooches and acessories made from unwanted,or vintage zippers that I have disassembled and made into quirky items. They have even been featured on C4 Cleospace and spotted on an episode of Shortland st! They appeal to a wide variety of people so make a great gift! Each brooch is handmade, so no two are exactly the same. Vintage Daffodil is approx 6.5cm across at the widest parts.The colours are sunny yellows and orange. This flower is made from vintage zips carefully hand sewn together ,It has a brooch pin on the reverse side so you can pin them to your favourite outfits/hat /bag/coat. Just imagine it on your favourite coat or jacket! I carefully wrap each zippitydoodah in acid free tissue paper before sending, and can gift wrap on request. Postage is $2.50 NZ wide or $5.50 for overnight courier. Please message me for international shipping prices. Check out my other items to see more zippitydoodahs, have a zippitydoodah day!